HOG WILD ON MOUNT HAM-ILTON! Stampeding through the low grasses comes the newest breed of Santa Clara County Park animals, the Brazen Trail Hog! 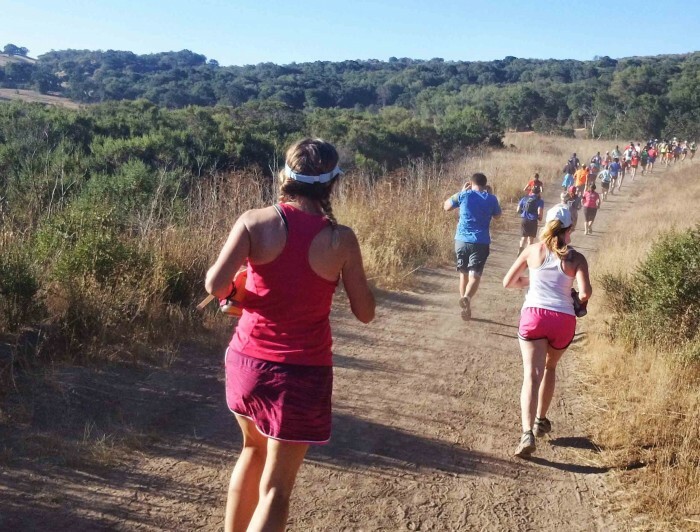 Come join us on Mount Hamilton for a late summer half marathon, 10K and 5K! All runners will receive finisher medals and special t-shirts (available in gender-specific styles and sizes from youth small up to men's 4XL). 8:00 am for the Half Marathon, 8:15 am for the 10K and 8:30 am for the 5K. A 7:30 am start will be available for hikers. Hikers must carry water and be capable of following the course map on their own. Course monitors and aid stations may not yet be open for the first part of the course. Hikers are not eligible for overall or age group awards, but do receive official finish times, finisher medals, shirts, etc., exactly the same as all other runners. With over 51 miles of trails, Joseph D. Grant park has lots of room to move and explore! Within this massive park are many different kinds of wild animals: 32 species of birds and 39 species of mammals, including European wild pigs! In addition, Grant Park has a wonderful camping facility which is available year round. Come make the race into a weekend mini break and enjoy all that the park has to offer!